Oil on canvas, signed and dated: "1879". Provenance: from the Estate of Aron Gordon. A painter and illustrator, Nichols was a member of quite an artistic family. His father, brother and wife were all professional painters as well. Oil-on-canvas, signed. There is a smaller version of this painting illustrated in ...British Equestrian Artists on pg. 186. Provenance: The Jockey Club, Washington, D.C.
Acrylic, signed lower right and titled on the reverse. Oil on canvas, signed lower right corner. A painter of portraits and genre scenes, Stiepevich emigrated from Russia eventually settling in Brooklyn, NY in 1878. He participated in numerous exhibitions and joined the Artists Fund Society. 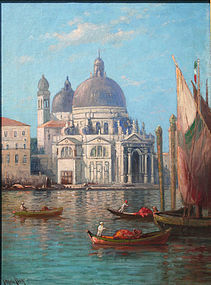 The Brooklyn Artists Academy, National Academy of Design, Pennsylvania Academy of Fine Art, Boston Art Club and Art Institute of Chicago all held exhibitions of his work. Oil on board. Found in one of his sketchbooks. A multitalented artist, Nelson was a skilled painter, lithographer and art conservator who was best known for his portraits and murals. He also taught art beginning at the age of 28 and continuing throughout his life. Oil on canvas, signed lower left and entitled on reverse. Oil on cradled panel, signed. Known as a painter of genre and religious scenes, Gons is credited as one of the founders of the Flemish Romantic School. He also specialized in window paintings. His work was exhibited at the Exposition Nationale de Bruxelles in 1857, Salon in Bruxelles in 1860 and Salon Antwerpen in 1861.